Danny Ferry’s in his own words: "He's (Deng) still a young guy overall, he's a good guy overall. But he's not perfect. He's got some African in him. And I don't say that in a bad way." These words were recently used to describe me. It would ordinarily make any African parent proud to hear their child recognized for their heritage. I’m proud to say I actually have a lot of African in me, not just “a little”. For my entire life, my identity has been a source of pride and strength. Among my family and friends, in my country of South Sudan and across the broader continent of Africa, I can think of no greater privilege than to do what I love for a living while also representing my heritage on the highest stage. Unfortunately, the comment about my heritage was not made with the same respect and appreciation. Concerning my free agency, the focus should purely have been on my professionalism and my ability as an athlete. Every person should have the right to be treated with respect and evaluated as an individual, rather than be reduced to a stereotype. I am saddened and disappointed that this way of thinking still exists today. I am even more disturbed that it was shared so freely in a business setting. However, there is comfort in knowing that there are people who aren’t comfortable with it and have the courage to speak up. In the same way a generalization should not define a group of people, the attitude of a few should not define a whole organization or league. Ultimately, I’m thankful to be with an organization that appreciates me for who I am and has gone out of its way to make me feel welcome. Why Is South Sudan Fighting? At a well-attended investor conference in South Sudan's capital just three weeks ago, President Salva Kiir declared that the world's newest country was "at last safe" and open for business. It was a bold assertion from a nation that only gained independence from Sudan in 2011 after decades mired in conflict. It suggested the moment had come to cap a huge international effort to build a state. But it proved spectacularly ill-timed. On Dec. 15, fighting erupted in Juba that has swiftly spread beyond the capital along ethnic faultlines, exposing the failure of national reconciliation efforts, the limited influence of generous foreign sponsors and the reluctance of rebel fighters-turned-statesmen to give up the tactics of bush conflict. Whether South Sudan tips into a broader ethnic war or draws back from the brink largely depends on two men who have long tussled for power: the president from the dominant Dinka tribe and the ambitious deputy he sacked in July, Riek Machar, a Nuer. Both ethnic groups, spurred on by their leaders, have clashed in the past, giving the latest spiral of violence an air of depressing inevitability for many South Sudanese, desperate for development in one of the poorest places in Africa. "Neither cares much about their people," said Chuo, who repairs motorbikes in Juba. "Instead, they are focusing too much on personal grudges - the left-overs from their old days." The United States and other Western backers of the new nation are scrambling with regional African states to broker talks, but have limited leverage to end fighting that has killed hundreds of people and driven 40,000 to U.N. bases for shelter. Failure to halt the escalation could have wider fallout in an already volatile region. Sudan may be drawn in if there is a threat to oil fields from which it derives vital fees from pumping crude across its land. And other neighbours fret about a descent into chaos. Uganda has already sent troops to Juba. Both leaders say they are ready to talk. But old habits die hard. Kiir said he was the target of a "foiled coup" and rounded up rivals. Machar slipped away and has mustered militia forces. "I am in the bush, and I am trying my best to have a better negotiating position," Machar, 61, who holds a doctorate from Britain's University of Bradford, told Reuters on a crackly mobile phone line from an undisclosed location. The international community has poured in billions of dollars of aid and sent in a myriad of advisers to build the new state. But it has been unable to fix the dysfunction that has festered at the top of government and which came to a head in the summer when 62-year-old Kiir dismissed his vice president. "Opportunities were certainly missed to engage in more robust preventive diplomacy over the past few months as the political crisis began gathering momentum," said John Prendergast, member of a U.S. group of intellectuals that cajoled Washington to back South Sudan's split from Sudan. In spite of Kiir's confident comments launching the Dec. 4-5 investment conference, a showdown had long been brewing with Machar, who has made no secret of his presidential ambitions. For almost a year before Machar's dismissal, the two men's relationship in office was defined by "miscommunication or mistrust or silence", said former culture ministry undersecretary Jok Madut Jok, who left his post in April. The powerplay caused stasis in government, and most worryingly derailed crucial efforts to build a programme of national reconciliation between bigger ethnic groups, such as Dinka and Nuer, and the dozens of others that have long clashed over control of the south's scant resources. 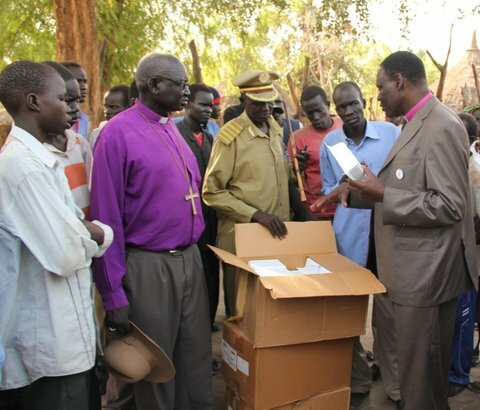 Jok, now chairman of the Sudd Institute think-tank, described how Machar formed a committee to draw up a "practical, scientific" plan to rebuild ethnic relations, only to have it disbanded by Kiir, who put church leaders in charge to "focus on praying away the woes of South Sudan and nothing more." Those who know the two men give similar accounts of the two characters on whose shoulders so much rests. Kiir, largely educated in the bush, has patched up militia rivalries to hold together the brittle SPLM/SPLA that fought Sudan and now runs the south. But they say he lacks the vision of his predecessor, John Garang, who died in a helicopter crash in 2005, the year a peace deal was signed with Sudan. Machar, his acquaintances say, is a highly intelligent rival whose political ambitions tend to trump any national agenda. He led a splinter SPLA group in 1991 and his Nuer troops massacred Dinkas in Bor town that year. In 1997, he signed a unilateral deal with Khartoum that gave him an official post in Sudan. "Anything short of the two men sitting down and trying to work it out will not work," said Jok. But bringing the two together for now has hit deadlock. Kiir's government has refused to release the group of rival politicians he detained. Machar says they must be freed as they are the ones who will handle any negotiations. Much may depend on Kiir's reputation as a conciliator, often bringing in rival militias even though it could mean putting political influence before competence in government. "Kiir has always said that he doesn't want his people to turn back again to war," said Foreign Minister Barnaba Marial Benjamin, citing the president's past talks with opponents. "We talked to them and they were absorbed into our government." Eric Reeves, a fellow American activist for South Sudan with Prendergast, said Machar needed to be convinced that prolonging any ethnic conflict would mean he would lose U.S. or other Western support. "But there is no real leverage," he said. 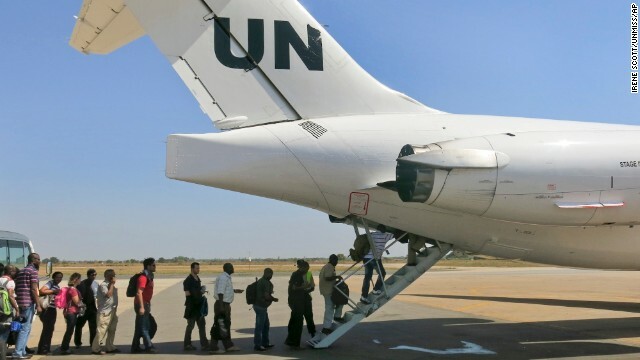 The United Nations plans to beef up its peacekeeping force in South Sudan, where the Akobo U.N. base was overrun and looted by Nuers who are blamed for killing 11 Dinkas sheltering there. But the patchwork nature of the SPLA army and shifting loyalties means there is little chance of turning the UNMISS force into a robust intervention brigade like the one that quelled a rebellion in next door Democractic Republic of Congo. "If you don't know where your enemy is coming from, or who your enemy is, it doesn't really matter how heavily armed you are," said Reeves. U.S. President Barack Obama said on Saturday that any military effort to seize power would end U.S. backing. His envoy, Donald Booth, was in Juba on Monday talking with Kiir. Fighting has already reached oil fields, near Sudan's border, cutting output by 45,000 barrels per day (bpd) to 200,000 bpd. That hurts flows that are the source of 98 percent of land-locked South Sudan's revenues. It is also vital to Sudan, which lost the fields when the south seceded but relies on fees from oil going through its pipeline to the Red Sea. A row over undefined borders, oil fees and security brought the new neighbours close to war last year. 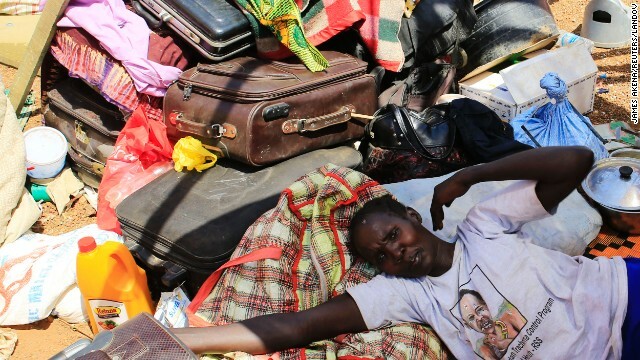 A South Sudanese academic, who asked not to be named, said Sudan could move on the fields if the fall in revenues started to bite and would worry about the deployment of troops from Uganda, which supported the south's SPLA in the war with Khartoum. Ugandan army sources said the troops would help secure Juba. Jok said Washington and its allies might have steered South Sudan on a safer course if a pell-mell rush to support the new nation had come with more state-building conditions earlier. "You might even say they (the international community) did too much to let these leaders off the hook from their responsibility to steer their country to stability," he said. But like others, he said the blame largely lies with the leaders, who have failed to make the transition from liberation warrior to politician, squandering international goodwill. Wounded Sudan People's Liberation Army (SPLA) veterans march during Independence Day ceremony in Juba July 9, 2011. Tens of thousands of South Sudanese danced and cheered as their new country formally declared its independence on Saturday, a hard-won separation from the north that also plunged the fractured region into a new period of uncertainty. With these words, "We, the democratically elected representatives of the people, based on the will of the people of South Sudan, and as confirmed by the outcome of the referendum of self-determination, hereby declare South Sudan to be an independent and sovereign nation," James Wani Igga the South Sudan’s parliament speaker on Saturday announced and proclaimed the Independence of a new country in Africa. "The independence declaration was read out in front of dozens of heads of state, including Sudanese President Omar al-Bashir, and foreign dignitaries as well as tens of thousands of cheering southerners. South Sudan’s national flag was then raised, to wild applause, tears and song. "We shall never, never surrender," the crowd chanted, as people whistled and wiped tears from their eyes. "I should cry for the recognition of this flag among the flags of the world," shouted one tearful man. "We have been denied our rights. Today, no more shall that happen," he added. The declaration affirmed the new state’s democratic and multi-ethnic and multi-confessional character, and its commitment to friendly relations with all countries "including the Republic of Sudan", Igga said. The parliament speaker said that as a "strategic priority," South Sudan would seek admission to the United Nations, the African Union, the east African bloc IGAD and other international bodies. Southern leader Salva Kiir then signed the transitional constitution and took the oath of office as the new state’s first president, swearing to "foster the development and welfare of the people of South Sudan." Kenya’s President Mwai Kibaki, the first foreign dignitary to speak, declared that his country "fully recognises" South Sudan. Egypt, another key regional power, also officially recognised the Republic of South Sudan, Foreign Minister Mohammed al-Oraby said on his arrival in Juba for the celebrations, the official MENA news agency reported. President Barack Obama announced that the United States formally recognised the new state. "I am proud to declare that the United States formally recognises the Republic of South Sudan as a sovereign and independent state upon this day, July 9, 2011," Obama said in a statement. The head of the visiting US delegation, Susan Rice, told the people of South Sudan: "Independence is not a gift you were given, but is a prize you won." "We salute those who did not live to see this moment — from leaders such as Dr. John Garang, to the ordinary citizens who rest in unmarked graves. We cannot bring them back. But we can honor their memory," she said. UN chief Ban Ki-moon, also speaking at the ceremony in Juba, said it was an important day for the United Nations, which has been in engaged promoting peace in Sudan for many years. "Today we open a new chapter when the people of South Sudan claim their freedom and dignity that is their birthright," he said. Ban commended Kiir and Bashir for the "difficult decisions and compromises" but noted key unresolved provisions of the 2005 peace agreement that ended Sudan’s devastating north-south civil war. He called on South Sudan to build its nation, saying sovereignty was "both a right and a great responsibility." Ethiopia’s President Meles Zenawi said his country recognised South Sudan’s sovereignty and looked forward "to welcoming you as a full member of IGAD." China’s special envoy extended President Hu Jintao’s "warmest congratulations" to the "young Republic" of South Sudan, while noting the ongoing negotiations between north and south. He said Beijing, Sudan’s main trading partner and the largest investor in its key oil industry, hoped the two sides could be "good neighbours, partners and brothers forever." British Prime Minister David Cameron announced that London also recognised the new state. The World Bank Group President Robert B. Zoellick also congratulated South Sudan, pledging to be "a strong partner as we help transform a day of independence into a decade of development."